Artichokes have been used as a digestive aid since ancient Egyptian times. Today, we know they contain nutrients that deliver several health benefits. However, full safety testing of artichoke supplements has not been conducted, so consult your health care provider before using it to treat any health condition. A perennial thistle belonging to the Cynara family, an artichoke has flower buds that develop into edible heads. The edible parts of each head include the base, which is called the heart, and the fleshy base of the leaves that form the artichoke. At the very center of the artichoke is an inedible mass of immature florets called the choke. Normal chemical processes in the body result in waste products called free radicals that are capable of damaging healthy cells. Antioxidants are substances that neutralize free radicals so that damage is avoided or limited. The U.S. Department of Agriculture Nutrient Database reports that one medium artichoke delivers 15 percent of the recommended daily intake of vitamin C, based on a 2,000 calorie-a-day diet. Vitamin C is an antioxidant that protects proteins, lipids, carbohydrates and nucleic acids from damage caused by free radicals. The Oxygen Radical Absorbance Capacity, or ORAC, system, which rates foods according to their antioxidant capability, gives artichokes a score that is nine times higher than other sources of vitamin C such as orange juice and red peppers. 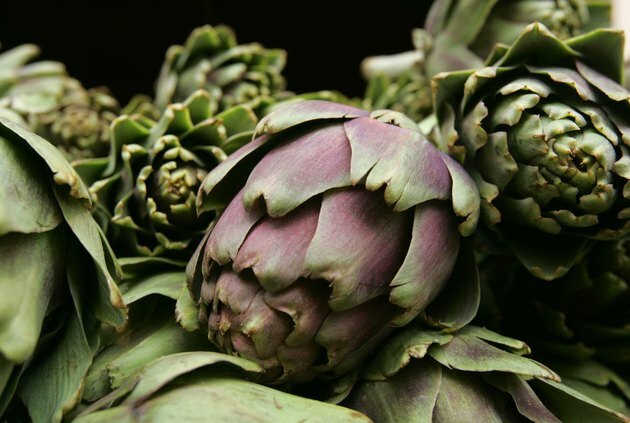 One medium artichoke provides 10.3 g of fiber, or 41 percent of the recommended daily value. The fiber found in artichokes, called inulin, promotes intestinal health by stimulating the growth of good bacteria in the colon. It is also a soluble fiber, which helps lower cholesterol and maintain balanced blood sugar. In the December 2003 issue of “Alimentary Pharmacology and Therapeutics,” G. Holtmann et al. reported that artichoke leaf extract was able to relieve the pain and discomfort associated with indigestion or acid reflux. Germany’s Commission E authorized artichoke for the treatment of dyspeptic problems, such as discomfort in the stomach, bloating, lack of appetite, nausea and mild diarrhea or constipation, according to Langone Medical Center at New York University. People with gallbladder disease should not use artichoke leaves or extracts until they consult their health care provider because they may stimulate gallbladder contraction, according to Langone Medical Center. Artichoke supplement also should not be used by pregnant or nursing women, young children, or people with liver or kidney disease.